The Finance and Banking industry is one of the most competitive out there, with many graduates facing a rigorous recruitment process. That is why many companies have opted to use psychometric tests during recruitment, as a way to screen the applications of thousands of graduates. Psychometric testing measures an applicant’s strengths and weaknesses and is, therefore, a reliable way in which employers can determine whether a graduate has the relevant skills for the job. Get hold of practice psychometric tests here. 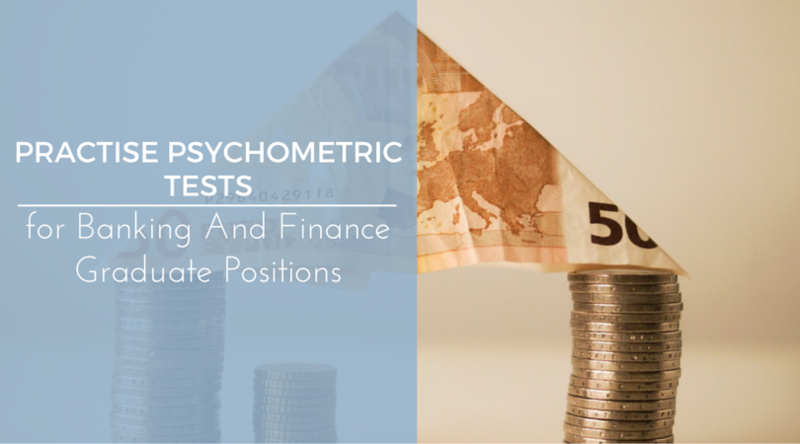 Below we are going to look at psychometric testing in closer detail, in relation to the finance and banking sector in Australia. Psychometric tests are used throughout the finance and banking industry, for jobs ranging from marketing, local business banking, and retail banking, to technology and accounting. These tests usually consist of an ability test (verbal, numerical, and abstract), and a personality questionnaire. Simply put, verbal reasoning tests are designed to assess your comprehension skills. This test is composed of syntax, comprehension, and sentence completion questions, which measure your ability to understand detailed analogies and textual concepts. Because most jobs in the finance and banking industry require great communication skills, you will find that many employers demand great verbal competency from their employees. Theory X and Theory Y are motivational theories developed by Dr Douglas McGregor in the 1960s and has seen extensive application in the field of human resource management. The underlying concept behind Theory X and Theory Y thinking is that managers subscribe to one of the two theories with regards to employee motivation. Theory X would assume that employees are inherently lazy and have a distain towards work, and therefore require close supervision and control in order to perform optimally at work. Theory Y would assume that employees do not inherently dislike work and instead may be ambitious and self-motivated; therefore allowing self-direction, freedom and the development of trust encourages optimum work performance. McGregor argues that Theory X thinking has been counterproductive in most modern situations, and that managers should aspire to hold Theory Y values in order to maximize performance, and encourage human resources management. 1. Theory X assumes that employees dislike work. 2. Theory Y has no effect on organizational performance. Solution: To answer the first question, you need to go back and re-read what the passage says about Theory X. The passage says ‘employees are inherently lazy and have a disdain towards work.’ This information supports the statement in question 1, meaning that the answer is A. Try a free sample verbal reasoning test. Numerical reasoning tests have been designed to measure how good you are at interpreting statistical expressions and numerical data. The tests include simple mathematics, fundamental arithmetic, and number sequences. Additionally, if you are applying for a job in management then you will need to be familiar with charts and graphs. Numerical ability is important in trader positions, and even though your job may not call for advanced mathematical skills you will need to be comfortable with numbers. In Year 3, how much more than Italy did Germany spend on computer imports? Solution: This question uses a simple deductive reasoning style. From the graph, the figures from Germany and Italy for Year 3 are 1,400 million and 700 million respectively. Therefore, Germany spent 700 million more than Italy, meaning that the correct answer is B.
Abstract reasoning tests measure your ability to discern relationships, to absorb new information, and to discover the underlying rationale of a pattern. Because abstract reasoning tests require you to identify similarities and patterns between different figures and shapes, they are a good way of measuring your abstract/fluid intelligence. You will find abstract tests in finance and banking jobs that call for problem-solving, initiative, strategy development, and organising complex data. As the name suggests, personality tests evaluate your behavioural style in order to determine whether your personality is right for your job and the culture of organization. These tests assess several things, such as how you deal with your emotions, how you relate with others, how you work, how you manage your stress, how predisposed you are to anger, how honest you are, and how much integrity you have. 1. Revelian (Onetest): Onetest is an Australian company that offers cognitive ability tests composed of 51 questions involving the following categories: numerical, verbal, and diagrammatic reasoning. The difficulty of the questions progresses during the test, which lasts for a total of 20 minutes. Practise Revelian’s cognitive ability tests here. CEB (formally known as SHL) is a psychometric test provider based in the UK. CEB-SHL’s ability tests are also known as verify tests, and include an assortment of tests which measure intelligence, and assess all the vital qualities needed for job success. It is no surprise that top financial institutions like Macquarie bank use these tests. Take SHL graduate aptitude practice tests here. Kenexa is a psychometric test publisher which offers psychometric tests to candidates during the recruitment process. Kenexa reasoning tests cover numerical reasoning and verbal reasoning abilities, each of which is tailored to the organization that uses it. IMC Pacific uses verbal, numerical, and abstract tests for its trader positions. Additionally, Optiver uses numerical reasoning tests for its trader positions, while Macquarie bank uses all of the 4 aforementioned tests throughout the board. Ernst and Young also use the numerical, verbal, and diagrammatic tests for their advisory, tax, assurance, transactions and financial services positions. Furthermore, the big banks such as NAB, ANZ, Westpac, and Commonwealth bank use numerical, verbal, and abstract tests for all of their graduate positions. As you can see from this list, few companies actually admit to using personality tests for their open graduate positions. Because psychometric tests provide fresh questions, you cannot prepare for them like you do with standard tests. However, here are a few tips that will ensure that you are not left blindsided when it comes time to sit the test. With this comprehensive article, I hope you can now see the importance of psychometric testing in the recruitment process. With the right preparation, you will be able to pass your psychometric test so that you are one step closer to achieving your job. Best of luck in the job application process, and do not forget to share this article so that all of your mates can be prepared as well. You can practise all different types of psychometric tests here. I’ve failed my psychometric test with an agency before and it sucked! From now on, I will start following these tips, hopefully it won’t take long for me to master it psychometric tests.